Then came .NET 2.0. Many things changed especially for ASP.NET. So I decided to write a sequel to the earlier series specifically for ASP.NET 2.0. This article will explain how a typical 3-tier architecture can be used in ASP.NET 2.0 with the help of Generics based collections and Data Source Controls. Note that the article aims at showing a simple 3 tier architecture and not at teaching you generics, data bound controls and data source controls. That means you must type case the element to the actual class type. This also means some performance penalty. If you are thinking it to be reasonable then have a look at the next example. Here the code adds an instance of Customer class, a string and an integer to the ArrayList. You will agree that errors can easily crop up while retrieving the values back. As you can see the code declares a new instance of List but it is not just List it is List of Customers. That means you can store only Customer instances in the List. Later on when you retrieve the values back you need not perform any typecasting. any attempt to store anything other than Customer objects will result in compile time error. Thus generic collections are better from performance as well as usage point of view. A three tiered application need not be necessarily distributed. Than means various layers (Data Access Layer, Business Logic Layer and User Interface Layer) can be within a single web site. You can of course separate out individual layers and host them on a dedicated server if you so wish. In such cases you may need to use Remoting or Web Services. The components in a three tired system are generally implemented in a class library. However in ASP.NET 2.0 there is one more alternative. The special folder App_Code is intended to store the classes used by your web site. You can neatly organize the classes inside the App_Code folder by creating subdirectories. In ASP.NET 1.x you would have used either DataSet or ArrayList kind of collection to pass data from one layer to the other. In ASP.NET 2.0 you can use DataSet in the same way as in 1.x. However, instead of using ArrayList you can go for generic List class. 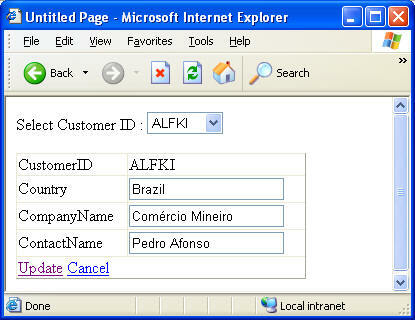 In ASP.NET 1.x the user interface layer consists of web forms. You need to assemble various server controls on the form and manually data bind them with the underlying data source. Tasks such as inserting, updating and deleting data were all manual i.e. you need to write code to accomplish them. In ASP.NET 2.0 new data bound controls such as GridView, DetailsView and FormView along with Data Source Controls come handy. They allow you to design the UI with minimal coding. The <connectionStrings> section is used to store database connection strings. In our example the connection string points to Northwind database from a SQL Server Express database. The SqlHelper class consists of several shared methods. In the shared constructor the class reads the connection string that we stored in the web.config file previously. In order to read the connection string the code uses ConfigurationManager class. 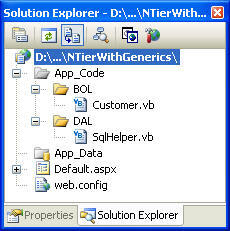 The ExecuteNonQuery() method is designed for action queries such as INSERT, UPDATE and DELETE. The overloads of ExecuteDataSet() method is intended to return a DataSet filled with the required records. The Customer class represents our Business Logic Layer. Open Customer class and add the following code to it. sql = "delete from customers where customerid=@custid"
The Customer class consists of four public properties and five public shared methods. The method names are self-explanatory. The methods essentially manipulate data from Customers table of Northwind database. Note the code marked in bold. We have imported System.Collections.Generic namespace because we want to return records as collection of Customer objects. Have a look carefully at SelectAll() method. The method returns a List of Customers. Inside we have declared a variable (arr) of type List. The SelectAll() method calls ExecuteDataSet() method of the SqlHelper class and retrieves a DataSet filled with required records. Then the method iterates through all the records from the DataSet and with each iterations add a Customer object to the List. The DropDownList shows a list of all CustomerIDs from the database. Once you select a perticular customer ID its details are displayed in the DetailsView below. 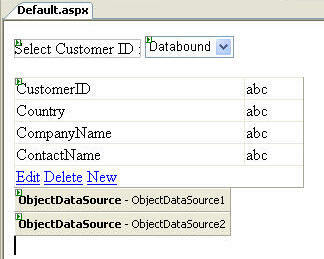 The DetailsView is bound with ObjectDataSource1 where as the DropDownList is bound with ObjectDataSource2. Select Customer class from the list and click Next. 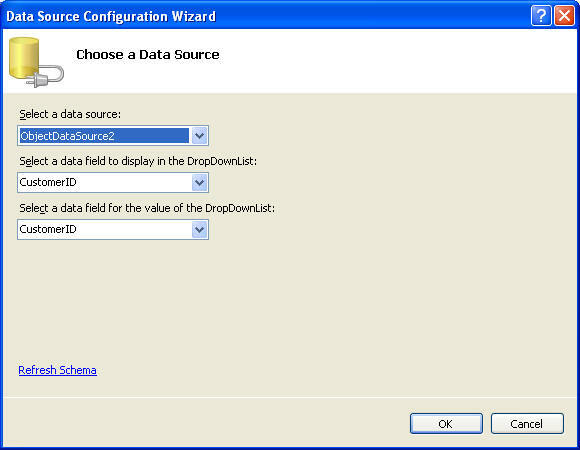 On the next Wizard step choose methods for selecting, updating, inserting and deleting data. In our case the methods are SelectSingle(), Update(), Insert() and Delete() respectively. Once you specify the methods click on Next. The next step will ask you the source of the custid parameter of SelectSingle() method. In our case the source control is DropDownList1. Click on Finish to close the Wizard. Similarly configure the ObjectDataSource2 to select all the Customers i.e. specify Select method as SelectAll(). We just finished configuring the object data source controls. Running the wizard sets the following important properties of the object data source controls. TypeName This property specifies the name of the class that is acting as a Business Object. In our case it is the Customer class. 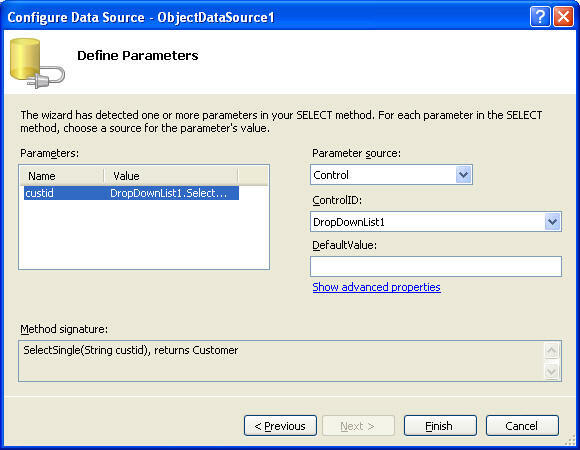 DataObjectTypeName This property indicates the object that is being passed as a parameter to Insert, Update and Delete methods. In our case it is the Customer class. 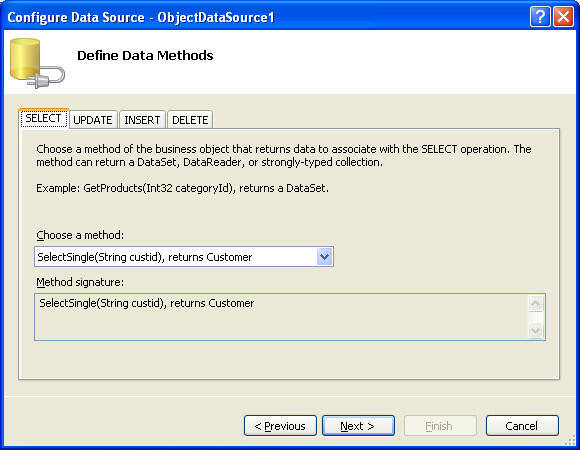 SelectMethod The method from Business Object that is going to fetch data. InsertMethod The method from Business Object that is going to insert record in the underlying data store. 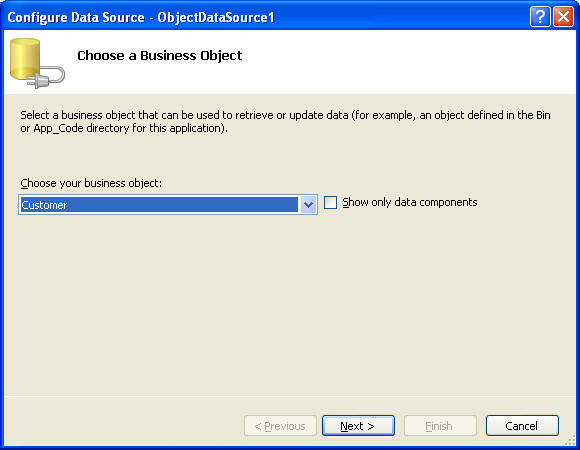 UpdateMethod The method from Business Object that is going to update record in the underlying data store. DeleteMethod The method from Business Object that is going to delete record in the underlying data store. Now open the smart tag of DetailsView and set its data source to ObjectDataSource1. Also, enable inserting, editing and deleting. Similarly open smart tag of DropDownList1 and set its data source to ObjectDtaSource2. Specify DataTextField and DataValueField properties as CustomerID. Finally enable AutoPostBack for the DropDownList. The event handlers simply call the DataBind() method of the DropDownList which causes it to repopulate itself. That's it. Run the web form and test editing and deleting functionality for different customers. The following figure shows the web form in action.